Back to school time is such an exciting time of year for both teachers and students as it brings on new changes and a fresh start. Now that you have everything ready for your child to head back to school, it's time to start thinking about what you will give your child's new teacher as back to school gift. Often parents like to start the year off when being introduced to the new teacher, either on the first day of school or the first parent-teacher night, with a small gift to thank them in advance for all they will do for their child this year. Here are 15 easy back to school teacher gifts that are perfect for busy parents. This classic gift couldn't be any easier to DIY! 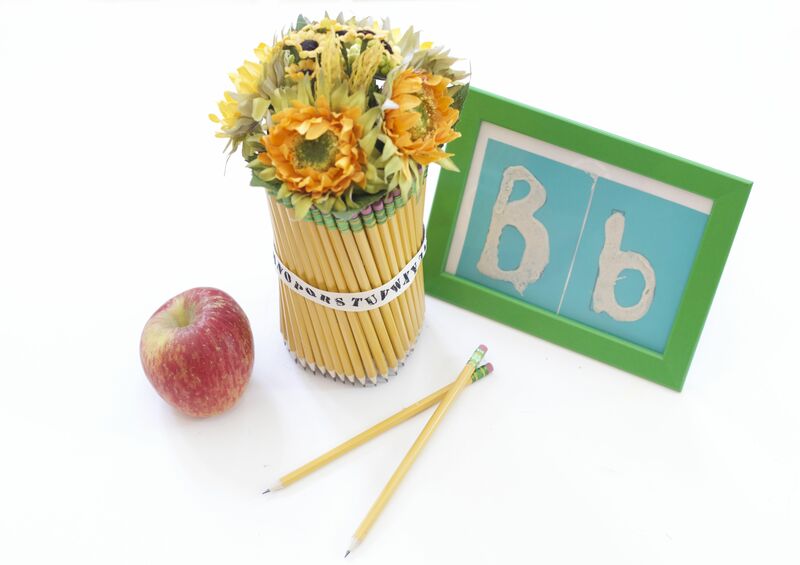 Hot glue pencils to a plain glass vase or simply use a rubber band to hold them together. Finish with a ribbon for the cutest gift that any elementary teacher would love! Create a lined school note page tote bag that is personalized with the teacher's name by decorating a pre-made tote bag. This handy tote will be the perfect thing to help the teacher transport assignments to mark back home. Start off on the bright foot this school year with a colorful and fun gift for your child's teacher. This easy DIY will take you no more than a few minutes. This DIY apple EOS lip balm is perfect for busy parents as the printable label quickly transforms a red lip moisturizer into a mini apple gift. 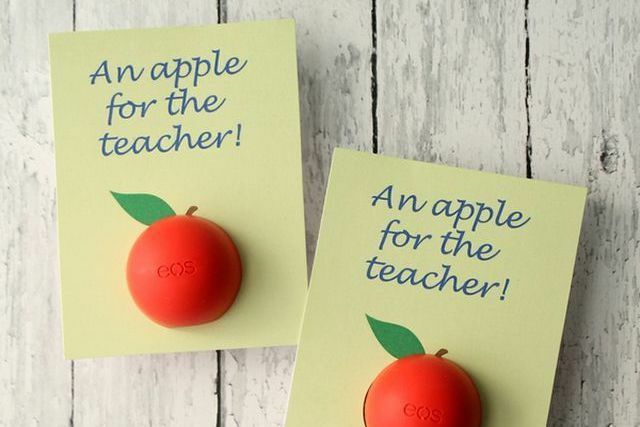 To make your own gift, just head to the store and pick up a red EOS lip balm for each of your child's teachers and print the "an apple for the teacher" template, where the EOS lip gloss can be fit inside. Skip the typical gift bag and package up the small gift you bought for your child's new teacher, such as candy or office supplies, in this super cute apple box which is made by folding paper into a 3D apple. This sweet idea will stand out among the other apple-themed gift and cards as something useful for your teacher to use. After a day of dealing with a room full of kids, what's better than going home and relaxing with some candles, a bottle of wine and a sweet-smelling scrub? If you are looking for a creative idea on what to give your child's teacher this year, this DIY soda gift that is made by printing out labels which say "I'm soda lighted you're my teacher" would be perfect. The soda gift will make for a welcomed caffeine treat for the teacher during their lunch break to help them recharge before teaching their afternoon classes. Everyone loves receiving a sweet treat like cookies! Be sure to double check if your child's new teacher has any dietary restrictions then find the perfect recipe to make a batch of cookies for this DIY. I Heart Naptime offers a huge variety of printable teacher label with cute decorative apple accent, there are labels to stick on bags, boxes and even a sticker template which you can stick on an apple. Depending on the size of your gift for your child's teacher these is different labels to fit the size of the gift to choose from, or if your child has multiple teachers you can use several different label designs so each teacher has a different gift label. The gift you get for your child's teacher does not need to be expensive, here is a great example of an inexpensive gift idea you can whip together on the night before school starts. A cheap reusable cup is turned into a teacher's gift by adding a printable label that says "cheers to the best school year." Whether your teacher is a coffee or tea drinker, she or he will surely appreciate a mug for their desk. Add a personal touch to make the gift that much more special. Everyone is going to be giving apple or pencil themed gifts to the new teacher so to stand out in the bunch make this cute strawberry gift basket instead which gathers strawberry soaps and lotions with a printable gift tag. Cut in half a paper mache apple that you can pick up at a craft store, and paint it a glossy red paint to create a small container which can be filled with wrapped candies for your child's teacher. Make this sparkling glitter apple mug that is dishwasher safe for your son or daughter's new teacher so that their new teacher can use the mug in the staff room to fuel up on coffee or tea at break time. Simple and easy, this craft takes little effort but still makes for a nice gesture for the new teacher.